Tesla has announced an event at the company’s Fremont, California factory next Tuesday, September 29th to celebrate the launch of the oft-delayed Model X crossover. 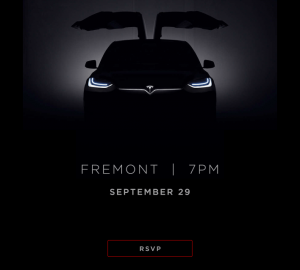 Currently, speculation seems to lend to the fact Tesla will lay out pricing and options for the X at the event, even though early deposit-holders have already been invited by the company to spec out their vehicles on a private site. While car enthusiasts are certainly looking forward to the Model X, it is not a vehicle for the common man as it will be just as expensive as the S.
Tesla’s first car for the mass market, the upcoming Model 3, will hit dealerships in 2017 and is expected to be the best selling vehicle from Elon Musk’s company.